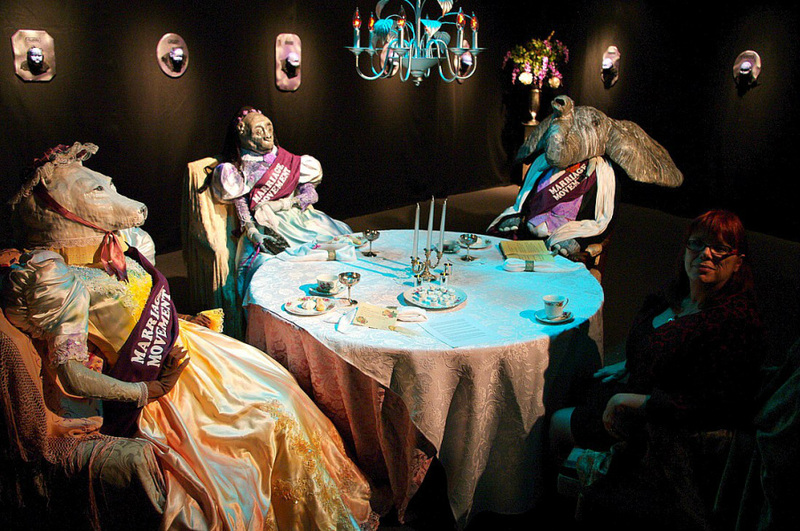 Ecological and conservation inspired art installationS with full-sized endangered animals populating the gallery, enjoying a Victorian-esque tea break...the catch? Tremmel’s sculptural figures in clay and mixed media explore the power of iconic images. They are juxtaposed paradoxically with conventional personal perceptions and unexpected placement within our ecological community on planet Earth. The exhibition is inspired by the African word “Ubuntu” which roughly translates as “I am because you are.” Selecting the unusual environment for the exhibition as a Table for Three the art pieces confront our self-identity within a world of reversed roles that encourage individual participation in an alternate world and reality. An internationally shown and published artist, Karen Mitchell Tremmel is a mixed media artist working as sculptor and painter. “I am forever mindful that art is the lost and found of our past and present, Nature and Culture, what is and what may be. From my thoughts a lump of clay is carefully manipulated and finally a thing of beauty emerges. All tension and uncertainty are relieved as my very personal vision is revealed to share with others.” K.M.T.